Sundance pads are made of the most durable materials we can find and with the finest workmanship available. Made in Canada for over forty years, these are our best quality pads. Sundance deluxe pads are a full cover side pad. At 15" wide on the ends and 22' wide on the sides. They cover both the frame and the springs. 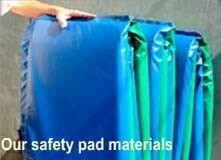 These top quality pads are made with an extremely heavy duty and durable outdoor covering fabric. The 18oz. coated-nylon covering fabric is the best fabric that we can buy, unlike many other manufacturers who use only 10 or 12 oz. laminated polyester. The filling is the highest grade, closed cell, athletic ethafoam, which will last many years and does not absorb water. These pads are made for permanent outdoor use.